Wow, I've been pretty inactive lately...procrastination nation right? Trying to get back on the horse though, starting with this Twisted Treeline Tier List, freshly updated with the new champion, Kayn! This time around Garen's a must pick/ban as a result of his minor rework. Luckily, he's just my kind of champion, easy and effective! This runs differently from the jungler comp as the utility jungler ends up giving the majority of the farm to the marksman top and doing peel-duty with support items. For the most part higher tier teams prefer one of the two support metas and funneling gold into a hypercarry, whereas lower divisions tend to be more comfortable running a jungle comp. Everybody else. Not to say that you can't win with other champions, but for the most part the ones above will give you plenty to work with. Feel free to try out other strategies and post your experiences in the comment section below! When you duo in one lane with a support, top is almost always better as it's easier to invade their jungle through the top lane, and it's much easier to bully the melee laner as well since they generally lack ranged waveclear. Anivia [God Tier Bot] - Anivia's ability to divide enemy teams and section off bottlenecks with her AOE are extremely potent on this map. Combined with the increased play in Trundle after his buffs, the double wall comp is simply something most people would rather AFK than deal with. Brand [Tier 1 Bot] - Brand is still very strong in his own right, but with Yasuo so strong and popular, he's losing a lot of his former potency. Garen [God Tier Top] - This Garen buff tho...so strong. 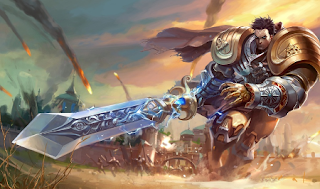 The newly reworked Garen is an absolute monster on Twisted Treeline, a place where he was already strong as a monster tank that could shred both tanks and squishies equally fast. Meanwhile, his villain passive is much stronger on this map since he gains percentage true damage against 33% of the team vs 20% of the team on Summoner's Rift. Kayn [Tier 1 Jungle] - The new champion Kayn is fairly difficult to play, but his ability to gank through the walls works well on this map, especially since there's no vision of him coming and the corridors are tight. Kled [Tier 1 Top] - Kled players are definitely enjoying him on this map. His ultimate is especially good due to the lack of wards on this map and long straight corridors, and his 1v1 ability is excellent. If enemies are unable to burst him before he gets back on his dinosaur, bad things happen...for them. Lucian [God Tier Marksman] - Lucian's amazing 1v1 potential is also amplified greatly by the reduced players on this map. He's more of an outplay type of marksman than one that needs babying, and the straight alleyways allow him to unload his full ultimate clip with ease. Malzahar [God Tier Bot] - Some players will likely disagree with Malzahar's placement here. While it's true that he can be countered by QSS and his lvl 1 push power is not the highest, if you're running two AD based champions top and jungle, then forcing the enemy team to spend on a QSS is very worth. Zac [Tier 1 Jungle] - Zac for most people is terrifying. His ganking power is certainly good, and his crowd-control is out of this world. However, in his current state, if you can get past the initial early game stage of his ganking power, most team comps can still deal with him as long as they're durable enough to survive the initial burst. While I'm by no means a guru on the Twisted Treeline I do enjoy playing the game mode quite a bit and look forward to climbing the new flex ladder.